Cue the "Jaws" music. 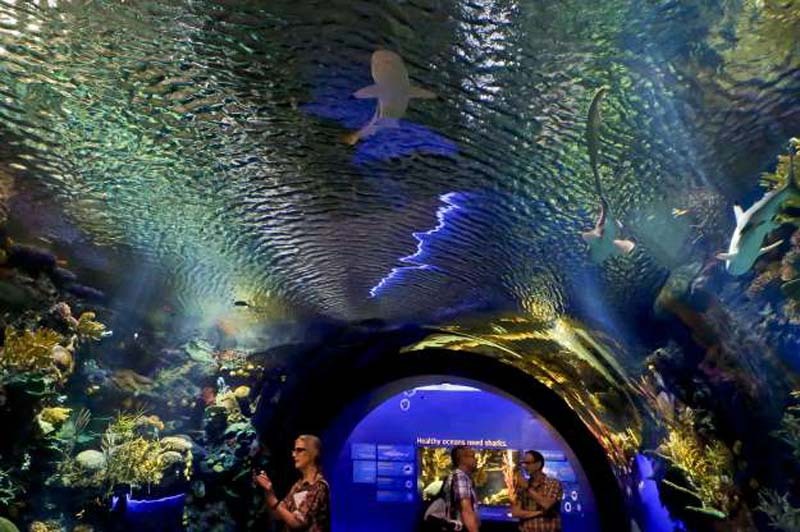 Sharks are the stars of a splashy new exhibit hall at the New York Aquarium that marks a major step in the beachfront facility's recovery from the devastating impact of 2012's Superstorm Sandy. Set in a shiny new building just behind the famed Coney Island boardwalk, "Ocean Wonders: Sharks!" with its largest tank at 379,000-gallons is set to open June 30 while work continues on the rest of the aquarium's 14-acre campus, more than half of which remains closed almost six years after Sandy. The Wildlife Conservation Society, which runs the aquarium along with the Bronx Zoo and other city zoos, was about to break ground on "Sharks!" when Sandy knocked out power and flooded exhibits, electrical equipment and administrative offices at the aquarium, which is situated on the narrow peninsula that forms Brooklyn's Coney Island. "I honestly thought in that first 20 minutes that we'd lost the aquarium," the facility's director, Jon Forrest Dohlin, said. The new shark exhibit was put on hold while staffers worked around the clock to rescue as many animals as possible and reopen the parts of the aquarium that weren't too badly damaged. Dohlin called the delayed debut of "Sharks!" a great step forward for the aquarium. The new exhibit is housed in a 57,500-square-foot building whose undulating shapes are clad in a "shimmer wall" of aluminum tiles that evoke scales or a school of sardines. Inside there are 12 species of sharks as well as six species of skates and rays. Dozens of other sea creatures from loggerhead sea turtles to striped bass join them in three massive tanks and several smaller ones. Sharks swim overhead in the tunnel-shaped coral reef exhibit, creating the illusion that the visitor is another ocean dweller. The other two big tanks are stocked with marine life not from the tropics but from the waters off New York, including red and white anemones, purple sea urchins and pink starfish that few New Yorkers would peg as neighbors. "If you go swimming in the water above your waist you're swimming with these animals," Dohlin said. "We want people to understand that there's all this cool stuff in our water." The $158 million "Sharks!" exhibit is opening amid ongoing work on the rest of the aquarium, which won't fully reopen until 2020. Dohlin and other staffers who lost their offices to Sandy are still working out of trailers, and Dohlin said his trailer is parked almost underneath Coney Island's Cyclone roller coaster. "All day long I can hear the rumble and feel the rumble and hear the screams," he said. "I thought, 'I'm going to go crazy.' My entire trailer shakes. And now I don't even notice it. It's only when it stops that I feel it." The shark tank will use its toothy predators as bait to promote awareness of threats to marine ecosystems including overfishing and pollution. Susan Chin, the Wildlife Conservation Society's in-house architect who led the new building's design team in collaboration with the firm of Edelman Sultan Knox Wood and its consultants, said she grew up in New York without ever knowing much about the ocean habitats that surround the city. "Wow, we have seahorses under the Brooklyn Bridge?" Chin said. "You've been living in this city all your life and you didn't know that. That's our job, to open people's eyes to nature. And to help them make that connection." The exhibit's showpiece is a huge tank representing the Hudson Canyon, a submarine canyon that starts near the mouth of the Hudson River between New York and New Jersey. There are sand tiger sharks with fearsome teeth, sandbar sharks with tall dorsal fins and nurse sharks huddled together on the floor of the tank. There are also small fish like permits and jack crevalles, a loggerhead turtle named Blue and a roughtail stingray named Ray Charles — both female. Other sections of the exhibit decry the plastic trash choking the oceans and promote sustainable fishing practices. Sharks are killed both by targeted fishing for their fins and as bycatch, caught by trawlers and long-line fishermen seeking other species. A main message of the exhibit is that sharks have more to fear from humans that humans have to fear from sharks. "We're really pushing against the tide of the perception of sharks that's been created by popular culture," Dohlin said. "Whether it's 'Jaws' or Shark Week, we know that people have a very monochromatic fear of sharks. They're large great whites that will eat you, that's what people think. The truth is, of course, they're very diverse, they're very important, they're getting wiped out. So that's something that we really want to turn on its head."